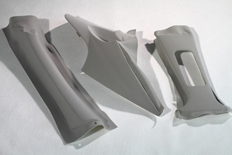 After the automotive branch became aware of the advantages of nonwovens many years ago, the use of these products has seen a rapid increase over the last decade and, above all, an enormous increase in applications. Today, nonwovens are extremely well established in the automobile branch and, because of their enormous innovative potential that nonwovens offer, their importance is continuing to increase. In some applications nonwovens appear as a surface material. In many other functions they remain mostly in the background – mostly taking over uses decisive for the working of a particular component. Our company of Lantor can rightly call itself a pioneer as we began supplying nonwovens to the automobile branch many years ago. We know the applications because of years of experience and have many tried-and-trusted solutions at hand available to you. We will gladly analyse your application or advise you on your particular project. Simply speak to us or send us your enquiry.